This was not an easy list to make at all. But after watching many Anime shows past and present, these are the five Anime shows that I know I can't live without. Well DBZ is the 2nd Anime that I have ever watch. I grew up watching Dragonball Z. Think of the impact DBZ has had on the Anime world. Yes it's no real deep story like Neon Genesis, and it's no Grave Of Fireflies. 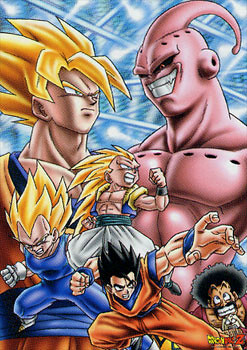 But DBZ is action pack and the characters are one of the most memorable ever. From the style of animation, to it's catchy background music. This show capture the Manga style flawlessly. Out of all the Gundam series out there such as, Gundam 08th MS Team, Stardust Memory, Gundam 0079 and of course Mobile Suit Gundam. This Gundam to me was the best of the best. The story and characters was really top notch. There are so many great battles and I felt that this was more emotional than the others. That's this show is a masterpiece. Not to mention it's fun, fun, fun. I love the characters in this one. From Renton to Moondoggie. I love to see the characters grow. I love how Renton grows from a dreamer to being a savior of the entire planet. There is more but you have to see for yourself. Simple because Neon Genesis Evangelion is one deep Anime. You really have to watch it at least three times, to capture and understand all the themes. I love the main character Shingi Ikari because he reflects me, more than any Anime character. The battle with depression, not knowing yourself, learning to come out of shell. These reasons is why I love Neon Genesis Evangelion. Favorite Neon Genesis Evangelion Moment? This is the Anime that started it all for me. This has everything romance, drama, action, great themes. Plus Robotech was the first Anime to featured an intteracial couple. This show is just magic. The debut of Minmei song "We Will Win"